As my blog subtitle indicates, I am a mother, daughter, wife and girlfriend. Time for the daughter part. My mom has been living independently for approximately 25-30 years. For most of those years, she managed quite well. That said, she does have a rather extensive medical history. The last couple of years it has become necessary for me to check on her more and more, to do her shopping, pay her bills, drive her to doctor appointments, etc. Fast forward to the morning of February 26th when I received a dreaded phone call. 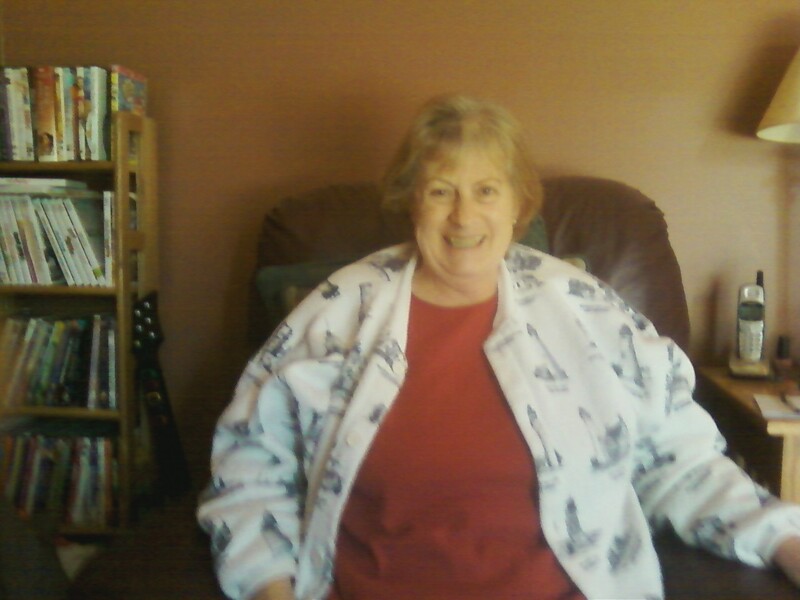 My mom had been found by her neighbor at the bottom of her basement stairs. She had fallen down the stairs and her head was bleeding. 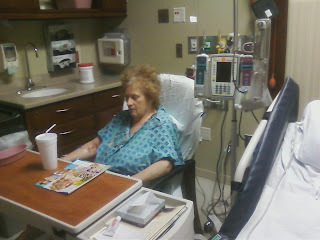 She was rushed to the emergency room where me and my family met her. She required five staples in her head, was badly bruised and disoriented. Miraculously, she did not break any bones. However, she was admitted to the hospital for six looong days of testing, evaluation and recovery. Around day five, I was told she would need outpatient physical and occupational therapy and that she should not live alone any longer. It was then that I made the difficult decision to bring my mom to our house -- at least for the rehabilitation process. For the past 4 weeks, I have been not only a daughter, but also what is known as a "caregiver". If you asked me 2-3 years ago what a caregiver was, I would not have been able to tell you. Luckily, the words "care" and "giver" are pretty self-explanatory....someone who "gives care", right!? And yet, it is soooo much more. Sociologists generally limit their discussion of caregiving to unpaid workers. Caregivers are typically family members, friends, and neighbors. Sometimes caregiving is done by those affiliated with religious institutions. While caregiving of all types is also done by paid workers such as nurses, social workers, and counselors, this is paid work, and thus is not in the same category. Caregiving rarely refers to the daily care that parents provide for their children, because this is classified as parenting; however, caring for an adult disabled daughter would be considered caregiving because it is outside of the norm of expectations for older adults." ﻿﻿﻿I have also been provided a nurse, home aide, physical and occupational therapist. All of that extra help will end this Friday. Sunday night I went to bed somewhere between 11:30 pm and midnite. Often I stay up later, but not last night. Suddenly, around 12:45 am I thought I heard the doorbell ring. I startled awake and then I realized I really did hear the doorbell ring! I whack my snoring husband....twice...and say "I think someone is ringing the doorbell". I kinda throw on a robe and go down the stairs...peek out and see a car with headlights in the driveway, but could not tell what kind of car it was. My heart is pounding...I peek through the blinds and see a policeman (a rather handsome policeman) on my front porch. My husband was slowly following behind me. I crack open the door, and he says..."sorry to bother you...I noticed your garage door was open and there have been a number of thefts in the area recently so I wanted to check and make sure everything's okay"... I thanked him and told him the kids must have left it open -- all the while fumbling and trying to keep my robe tied tightly so as not to be arrested for indecent exposure...lol. Those kids....that husband!! The husband recently put in a new garage door opener but apparently the laser or whatever, sometimes gets out of alignment and the door does not close all the way. The kids were outside last night and thought it closed, but it didn't. Meanwhile, did my dog, who sleeps in a crate on our main floor even bark or stand up during this door bell/policeman exchange??? Nope! Did my mom*, who happens to be staying with us on our main floor, wake up? Nope. So much for security... From now on I will be doublechecking our garage door like I used to before I go to bed. If for no other reason than to avoid interrupting my sleep. 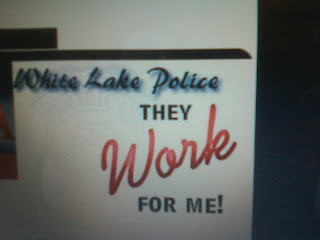 and they wake you up to tell you so!!! ﻿﻿﻿﻿﻿ *More on my mom in a future post. They Were Right...Kids Do Grow Up Fast! During the month of March the schools do a lot of preparation for the following school year. There are meetings, more notes and paperwork, scheduling, and the planning goes into full swing. This I knew, and yet I wasn't totally prepared for the reality that Megan will be a freshman in high school and Jacob and Kristin will begin middle school -- all this Fall. With this comes important decisions for both students and parents. Which extracurricular activities, enroll in laptop program, start/continue band, which electives are appropriate, will honors classes be too difficult, buy or rent an instrument, foreign language/which one, etc...? ? Lots to consider. But for now, never mind that. It truly seems like only a year or two ago when Jacob and Kristin got on the big yellow bus to go to kindergarten, and Megan just started middle school...didn't she?? I think it's safe to say that when the elementary school has their 5th grade graduation and the middle school graduates their 8th graders....well, let's just say I will need to be sure I have my tissues with me. 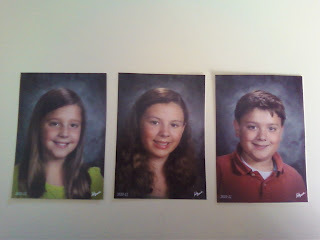 Afterall, I have had kids in elementary school for the past nine years and then, presto! -- we are done with the parties, and the valentines, recess, snow pants, homeroom teachers, etc... Yes, I know, growing up is good (for other people's kids)! Another case in point. Last month I attended one of my BFF's daughter's wedding!! How is this even possible?? 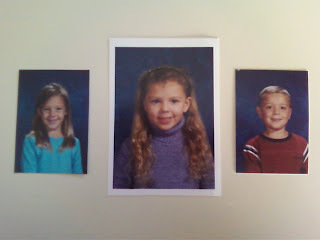 Believe it or not, I don't feel old enough. I was at the hospital when she was born, I was thrilled to be chosen as her godmother, I was one of her first babysitters when she was a newborn, I remember her dressing up for Halloween, softball games, homecomings, proms, high school graduation, college graduation, first "real" job... Now, she has grown up to become a beautiful, smart, caring young woman....and she is married! Maybe it's not that they're growing up....it's that their growing up means... I am getting older!! Potty Bells...A Craft Project for Lazy/Cheap People!!?? Well, you may have noticed from my blog picture that we have a "puppy". Yes, that big dog is technically still a puppy -- although his first birthday is fast approaching. When we rescued "Lucky" last July, I had heard from a friend about "bell training". For those who don't know, basically, you hang a bell (or bells) from the door where you let your dog out, and the dog then learns to ring the bells when he/she wants to go out and "take care of business". Well, that sounded like a great idea to me. We previously had owned two English Setters ("Cocoa" and "Cola"). They were our kids....before kids.... At that time, I did not know of "bell training". They just used the good old-fashioned whining, barking, pawing at the door method. 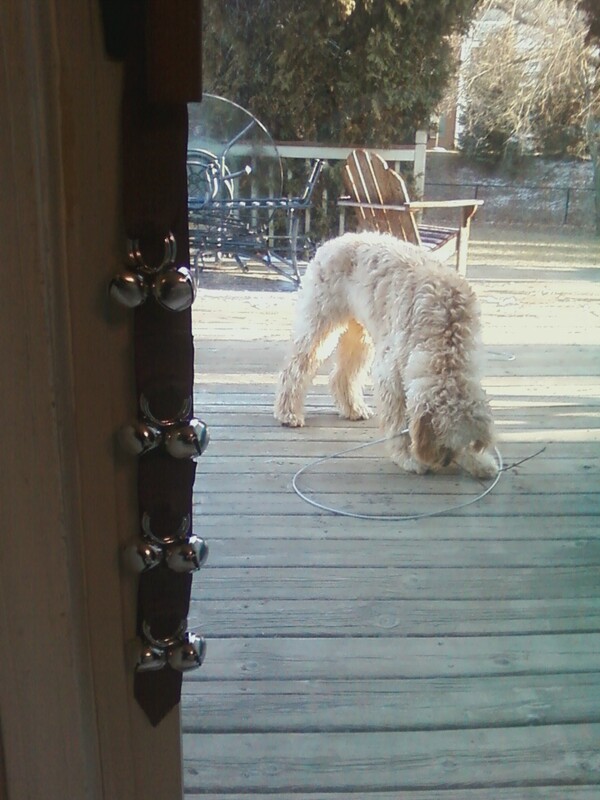 For Lucky, I decided to purchase some random bells from the Dollar Tree and hung them on a ribbon on the back door. 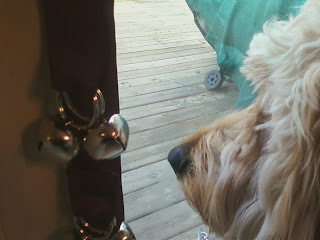 Luckily...."Lucky" seemed to know right away what those bells were for. He was awesome to train and we were very.........that's right.....lucky!!! He honestly has not had an "accident" in the house since the first two weeks we brought him home. I don't think it's the potty bells....he's just smart :) !! A short time later I realized that they sell "pretty" potty bells (sometimes called Poochie Bells) at Pet Supplies Plus and other pet stores, as well as on the internet. Well, they cost approximately $20 and.....I am too cheap to pay that much!! A couple of months ago when I was at Michaels for something else, I realized I should buy the materials that I was reasonably sure I would need to make those Potty Bells myself!!! Honestly, I also wanted to wait until the "teething" puppy stage was winding down a bit so as to lessen the chance of our dog eating said potty bells. 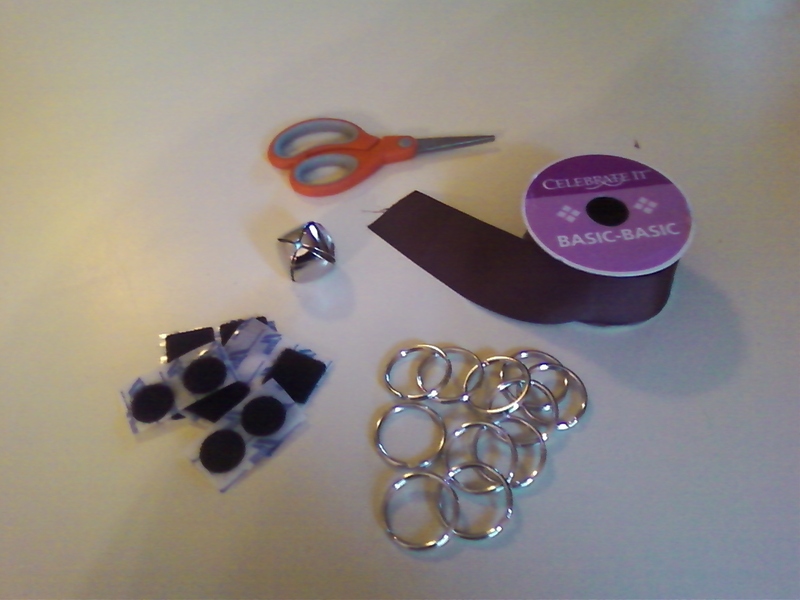 So, today, when I had a million more important things to do, I whipped together my version of (sorta) pretty potty bells... So easy, I did it while sitting on the couch talking to my mom. A Practical, Easy and Affordable* no-sew project! Anyone else using the bell training method? Lucky ringing bells to go "Potty"
The finished product and Lucky on his way back from his potty break! *Didn't save receipts (never thought I'd be blogging about it) but spent approx. $10 with supplies left for more!! 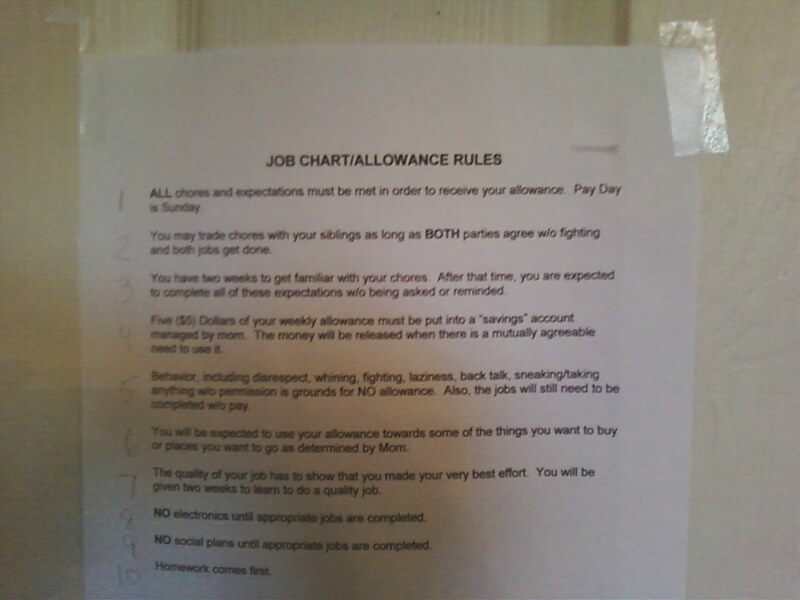 Sooo, I have two 10 year olds and one 13 year old....don't ya think it's about time they had some kind of chores they are expected to do around here?? I am not just talking about helping out when asked. They have been pretty good about that. 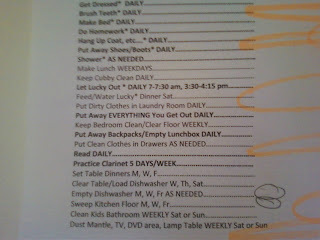 I am talking about consistently daily/weekly helping around the house and picking up after themselves! Yes, it's definitely time. In fact, it's probably long overdue. At 13, Megan has quickly learned that money talks. She wants things. All kinds of things. Her mommy is no longer able to buy her a toy or coloring book to keep her happy. 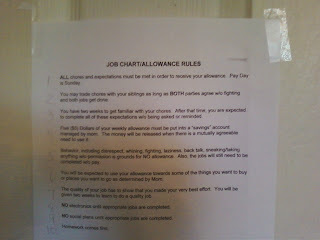 Right now, she is sooo desperate for a Vera Bradley purse, she actually made her own job chart. I have been struggling with a good system for months/years. Megan took matters into her own hands. She went on myjobchart.com and got it done! However, I am still not sure I believe in paying kids for helping around the house. At the same time, being social with their friends is important and often times means going somewhere that costs money. So, now when they want to go to a movie, bowling, to see their friend skate in an ice show, to Zap Zone or "shopping" with their friends, instead of me giving them the $$, I think it is better for them to budget and make decisions with their own money and decide what is really important. But then, where do you draw the line between what is expected to be done, and what is above and beyond the call of duty? 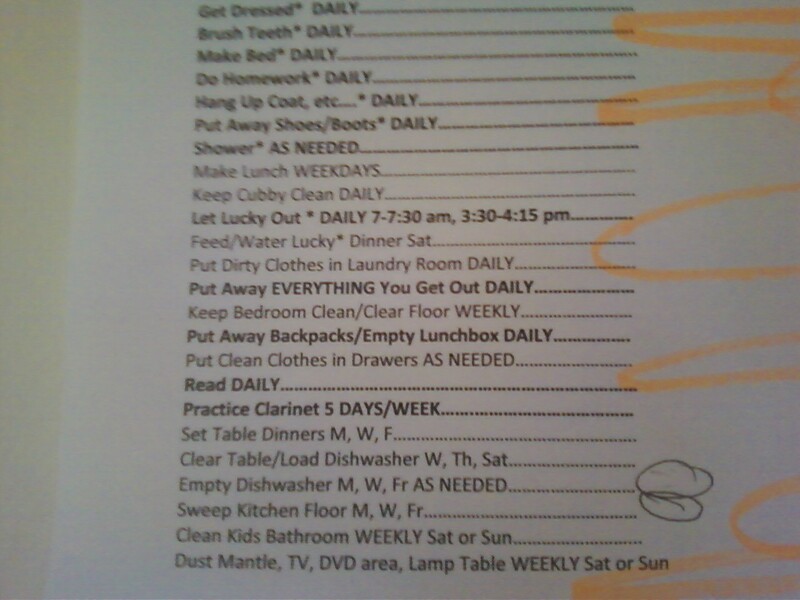 For example, is putting your backpack away each day a chore. No, it is expected that you pick up after yourself. Is brushing your teeth a chore? No, you are supposed to brush your teeth because you want nice teeth! (Ask kids and they might not agree...Jacob). Then there is the question of age appropriate chores. Should a 13 year old be expected to do more than a 10 year old? Yes, I think so. Also, what happens when your kids are busy and have basketball or swimming or soccer after school and literally have 3 hours or less on school nights to do their homework, eat dinner and take a shower. So, what is "fair" these days? Life is not always fair. Chores are not always fair. Salaries in "real life" are not always fair. So far what seems to be working is that I am holding half of their weekly allowance as savings and giving them the other half. The savings part is intended to allow them to save for a bigger item they may want at which time I will release the temporary savings if I approve of the item. Does that make sense? Also, we have an upcoming vacation and they can use that money towards the many "souvenirs" they will be wanting. Something tells me they will be much more selective about those souvenirs when they have to pay for them with their own money. 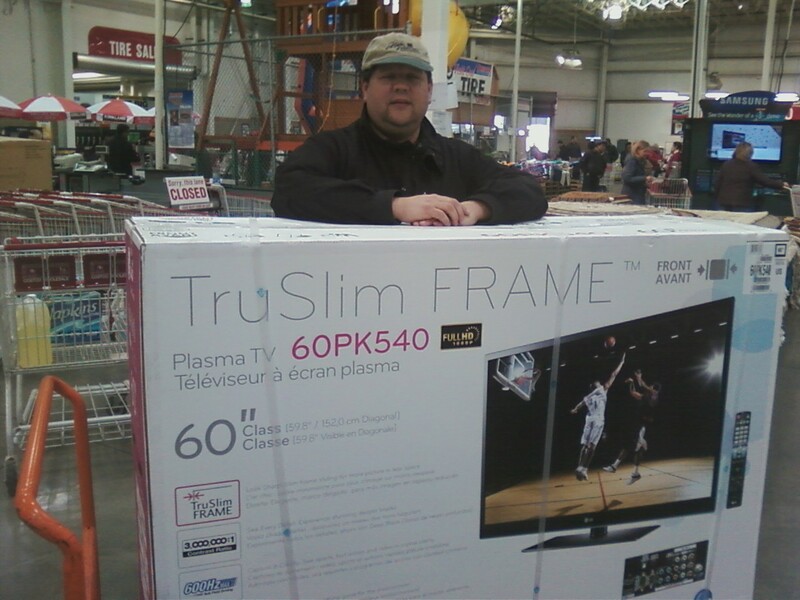 Oh well, fast forward to our recent quick trips to Walmart, Target and Costco and here we have a picture of the proud new owner of a 60" LG Plasma TV purchased on a recent Sunday at Costco. We were also considering a 55" Vizio LED, however, after a quick phone call to my brother who had recently bought his own new TV, he said "bigger is always better" and "go Plasma". Men are all the same, right? 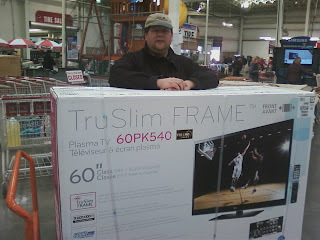 Although Costco is a store known for its bulk purchases, there was something particularly funny (and embarrassing) about watching my husband trying to put this big box on one of those big carts (of course he wasn't going to ask for help, so I asked the Costco guy for him), and then wheeling it to the checkout trying to hide his smile while everyone seemed to be staring at us as if to say....gosh really? Don't you just need a giant bag of toilet paper or a case of water like the rest of us!?? Truth be told, we all do have some TV shows we are addicted to. Thanks to the DVR, it is usually possible to keep everyone happy. The kids also like to play their Wii games -- Just Dance 2 is quite popular with them lately. 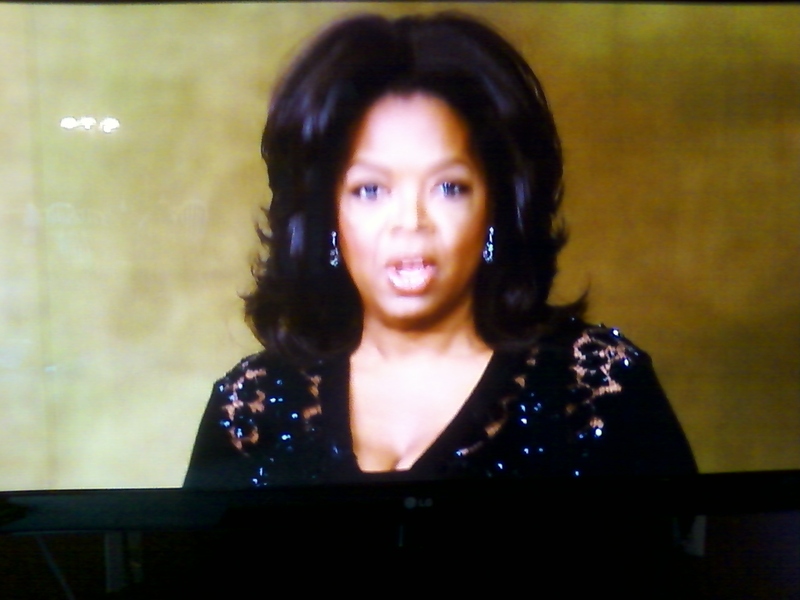 Oh, and me, I can't complain ...nothing like some "Real Housewives" drama or Oprah herself coming directly into our family room! !